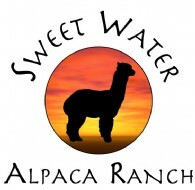 Recently History2 channel featured Sweet Water Alpaca Ranch in the series Stan Lee's Superhumans. Chi Master Kanzawa Sensei from Japan claims to be able to put any animal to sleep using the ancient art of Chi. He also cured one of my females that had come down with a very strange paralysis that morning. He used Chi on her and within 10 minutes she was fully restored and never had any more symptoms of lameness! It was quite extraordinary! 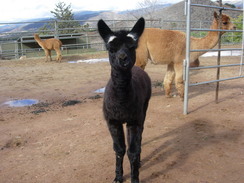 Over a year ago the TV series, Stan Lee's Superhumans, filmed a segment at my ranch featuring my alpacas. It is currently being shown on the History2 Channel on Sunday evenings. The episode is called "Beast Masters". My segment features Chi Master Kanzawa Sensei who was flown in from Japan. Mr, Sensei claims he can put any animal into a trance by using mind control. I will post the link here as soon as History2 has unlocked the video. 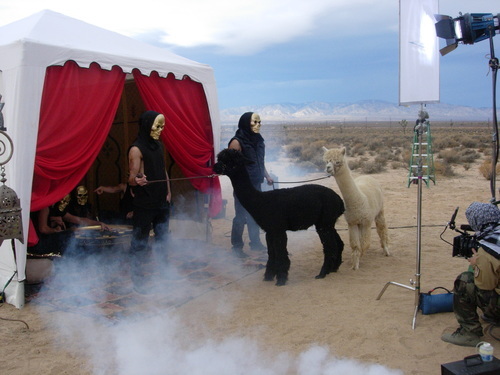 What he did after the filming though was most extraordinary as he worked with one of my female alpacas who that same morning was behaving very strangely. 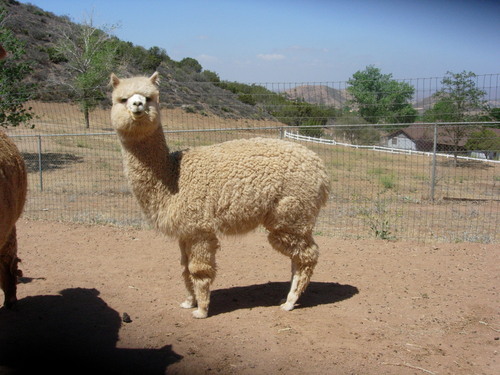 She was almost paralyzed in her hind legs and hips as well as not being able to eat as if her jaw was paralyzed. I gave her some Banamine hopeing that would help. As the day went on she showed no improvement. I told Mr. Sensei about her and at the end of the day he went to see her. She was still not able to eat. Mr. Sensei started working on her, standing 4-5 feet away from her, just using his mind and Chi power. We gradually started seing improvement and after about 20 minutes she was fully restored, moving and eating totally normally. She has never had the symptoms again! 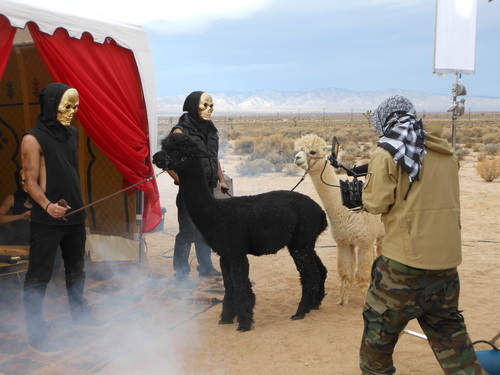 At the beginning of the year two of my alpacas, SW Amadeus' Mozart and SW Perfect Storm, were booked to take part in a music video. 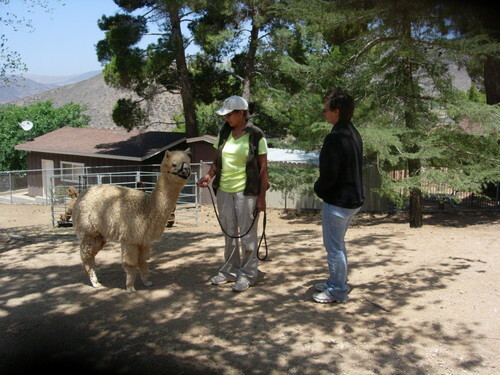 We trailered to the location in the Antelope Valley and spent the day filming. Here is the Youtube K. Rose video, Booji Girl, featuring my two boys. To see it you can copy and paste the link below into your browser window. 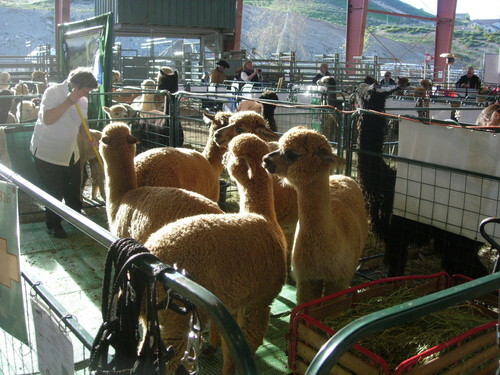 Finally we were able to shear the alpacas. 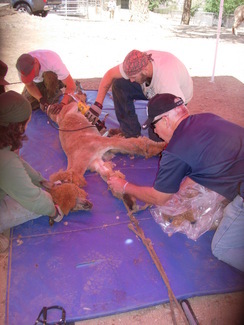 Shearing was a little later than previous years, but with the cool spring that we have had it worked out fine. The heat has now set in with a vengence. The almost dozen helpers enjoyed the busy day on the farm. 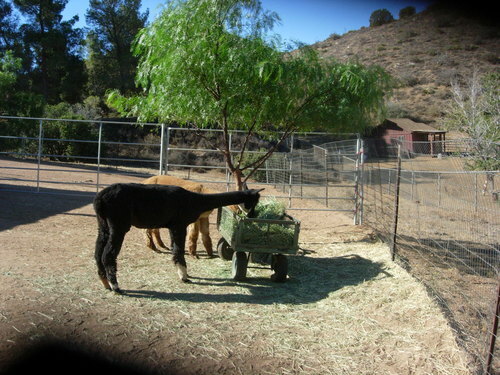 The animals were calm and co-operative. 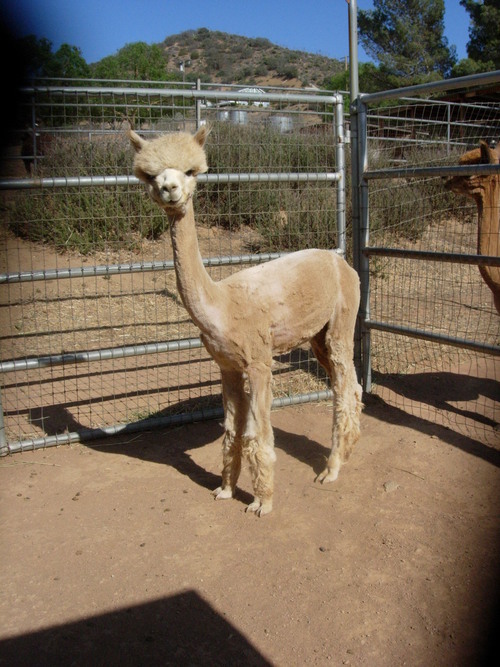 I am convinced the alpacas who have previously been sheard remember how good it feels to have all of that fleece taken off. Last year my girl Madonna was having a spitting fit, whereas this year she was as good as could be. 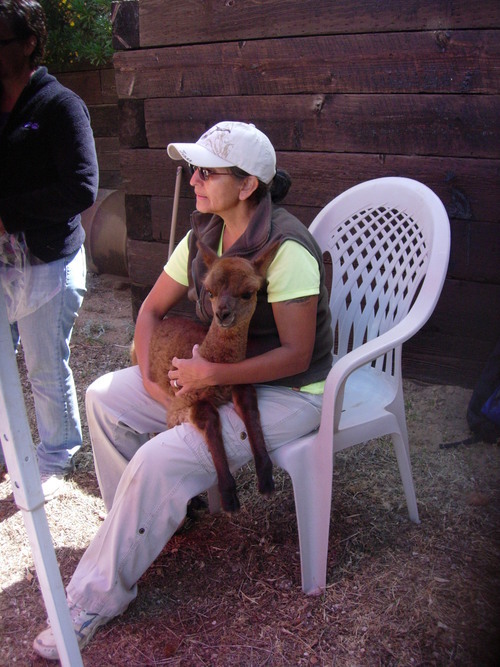 We even sheared the young crias that had been born this spring so that they will be comfortable during the summer. It is also good to get the damaged tips off as they will stay cleaner that way. 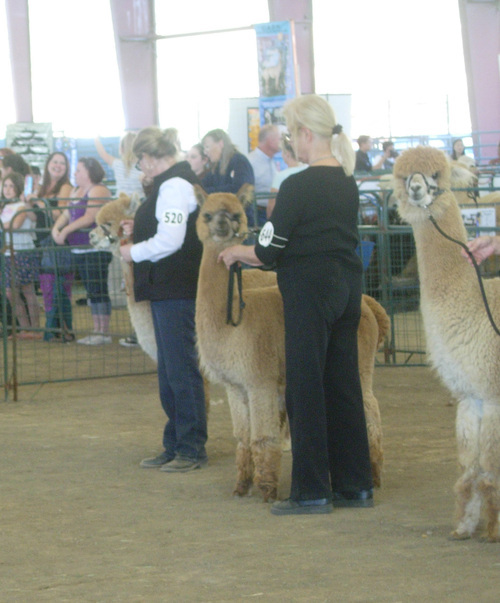 This past weekend I took 5 alpacas, 2 of mine and 3 agisters, to the SWRAS alpaca show in Norco, Southern California. 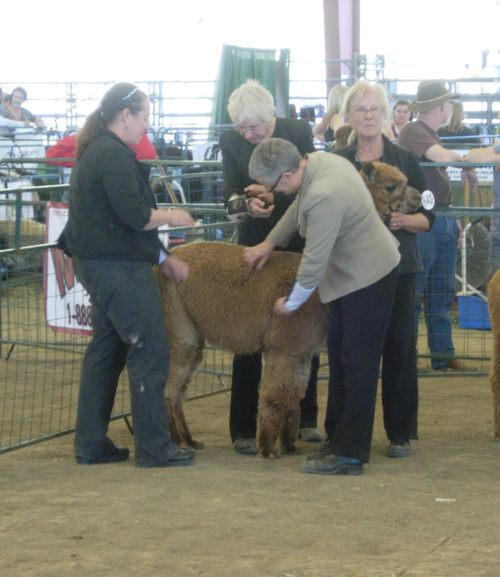 It was a wonderful weekend with over 300 entries. My lovely girl SW Lexie took 1st price in her class. 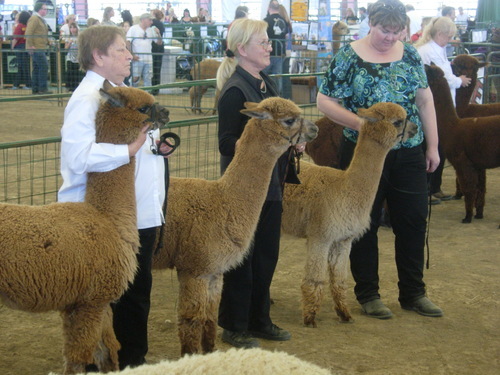 I also received ribbons in the very competitive classes, Get of Sire (SW Inca Bronze) and Produce of Dam (Tsunami's Valentina). 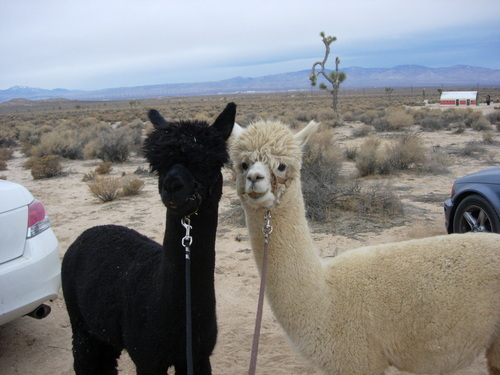 This week two of my alpacas went on location in the Mojave Desert. Both Perfect Storm and Amadeus' Mozat did an outstanding job and performed like pros despite scary masked men, flowing gowns and spotlights in their faces. The shoot was for a music video with a young singer, K. Rose. We had a lot of fun, but the boys were happy after a long day's work to be home again with the rest of the herd. I will post the Ytube link as soon as I get it. 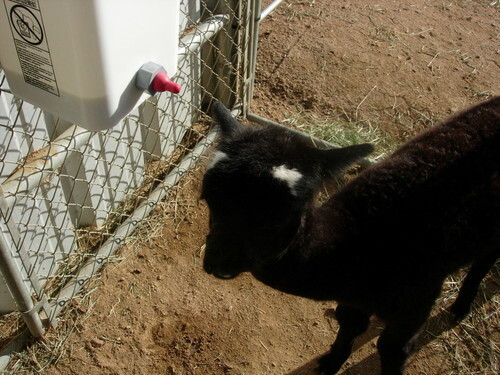 Starting to bucket feed my cria. Five weeks ago I was faced with having to bottle feed a young cria. The first week I took her in the house at night and kept her in the bathroom so that she was protected from the cold nights, and I could feed her in comfort. She was fed every 2-3 hours. After a week she stayed out at night and got the last feed late in the evening, then first thing in the morning. She is doing well and gaining weight very nicely. However, with the holidays coming up I was trying to find a way for her to feed herself so that I could get away and celebrate with my family in San Diego. 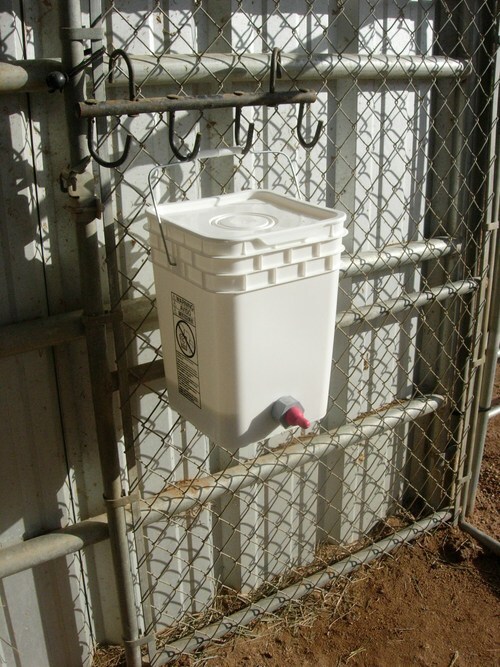 I heard about feeding crias from a bucket! I found the supplies had everything hooked up per instructions. Then I just had to make her realize that milk was available to her at any time. She still wants a bottle from me when I come down for feeding but she is obviously drinking from it as I can see the milk level going down quite nicely. She has doubled in weight and growing very strong. 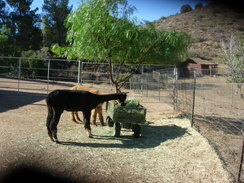 Now at 2 months old she is also eating quite a bit of hay. She is doing very well! OK, so where is the food! ?